In almost every cuisine in the world, there is soup. Soup can take the form of a starter or appetizer, a hearty main, a snack or a meal on its own. Soup is great. But when we think of soup, we usually end up thinking of the cliché that soup is something that’s “good for you” but not exciting in any way. How would you get young people to think of soup as exciting again, and to make soup the perfect snack that keeps them going during their busy day. 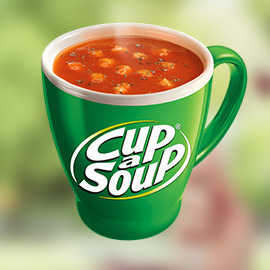 How would you change young adults’ perception of Cup-a-Soup from boring to fun and make it the first thing they reach for when they’re feeling hungry and need a snack to quell their hunger pangs. Format: 1st page poster with a tagline; 2nd page answers to the three questions (max 2 pages PDF).